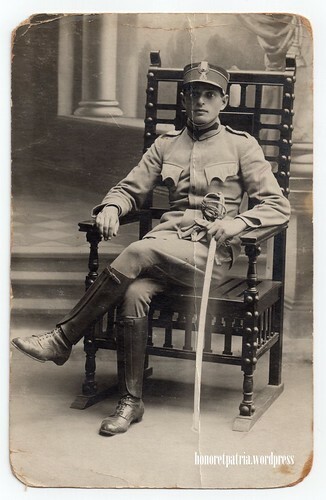 Romanian 2nd class intendance NCO, circa 1913. Romanian 2nd class intendance NCO, circa 1913., a photo by honoretpatria.wordpress on Flickr. Via Flickr:First picture of two, representing an unknown chap, it seems he survived the war (see next photo). On the back: Foto „Rembrandt” Jassy. Photo taken circa 1913, maybe around the mobilisation for the Second Balkan War.Uniform: officer’s green-grey M1912 tunic.Head dress: M1912 sub-lieutenant’s dress kepi, with King Carol I cipher.Rank: intendance (administration) 2nd class NCO (his epaulettes show the rank of ”plutonier” but he is wearing an officer’s uniform).Sword: officer’s M1893 with M1909 regulation scabbard (2nd ring removed).Location: Iași, Romanian Kingdom, circa 1913.